the Paragon Ragtime Orchestra, Rick Benjamin, conductor. “Rockaway” (1917), [w] Howard Johnson, Alex Rogers; [m] C. “Lucky” Roberts. “After You’ve Gone” (1918), [w] Henry Creamer & [m] Turner Layton. “By the Light of the Silvery Moon” (1909), [w] Edward Madden & [m] Gus Edwards. “The Cubanola Glide” (1909), [w] Vincent Bryan & [m] Harry Von Tilzer. “The Dardanella Blue”s (1920), [w] Johnny s. Black, Felix Bernard; [m] Fred Fischer. 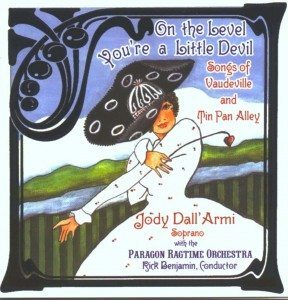 “On the Level, You’re a Little Devil” (1918), [w] Joe Young & [m] Jean Schwartz. “Poor Butterfly” (1916), [w] John L. Golden & [m] Raymond Hubbell. “The Honeysuckle and the Bee” (1901), [w] William H. Penn & [m] Albert H. Fitz. “Meet Me in St. Louis, Louis” (1904), [w] Andrew B. Sterling & [m] Kerry Mills. [w] Sam M. Lewis, Joe Young; [m] Pete Wendling. “The International Rag” (1913), [w & m] Irving Berlin. “They Didn’t Believe Me” (1914), [w] Herbert Reynolds & [m] Jerome Kern. [m] Jack Norworth & Nora Bayes. “Ragtime Violin!” (1911), [w & m] Irving Berlin. “Who Are You With Tonight?” (1910), [w] Harry Williams & [m] Egbert Van Alstyne.